It is estimated that lighting accounts for 19% of the world’s energy consumption and demand for artificial light will grow by 80% by 2030. New Solid-State Lighting technology is giving a helping hand and could reduce lighting energy consumption by 50% within 2025. LEDs are driving a paradigm shift away from traditional power-hungry incandescents toward energy efficient, longer life and sustainable lighting solutions. From street lights to giant video screens, from car headlights to indoor illumination, solid-state lighting systems offer compelling benefits and are already transforming the industry. LEDs last more than 25 times longer than incandescent lamps and 5 times longer than CFLs. 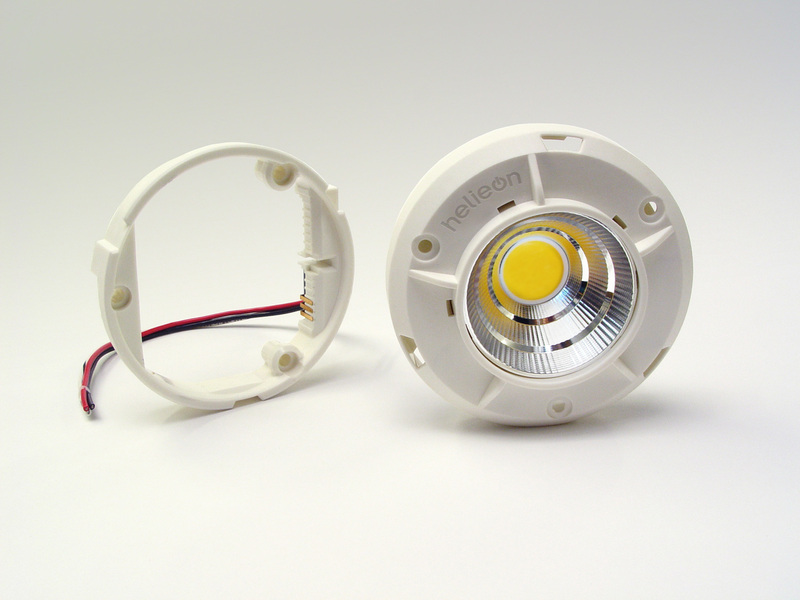 With no filament to break, LEDs are not only robust, but withstand vibration, unlike traditional lamps. Additional advantages include dimmability, instant-on capability, no UV radiation, no mercury, no lead, good color rendering and full color spectrum. All of this is crystal clear. However there are some crucial questions to answer: what has Molex to do with illumination??? Why is Molex now manufacturing LED modules??? Molex has no experience in tungsten wires, inert gases or glass but these technologies belong to the past and have no relation with LED Lighting. LED-based lighting requires different expertise. Even well-established lighting fixture manufacturers can struggle with light sources that are actually electronic components to be connected to an electronic circuit. And if you make a mess and have to scrap a high power LED, you may be throwing $10 to 20 in the bin! The lighting industry has converged into the electronic component space; Molex space. Molex created Helieon® light modules combining our best-in-class electrical, thermal and optical expertise with innovative in-house design and manufacturing capabilities to help luminaire manufacturers to deal with these 3 key aspects for an effective and durable LED application. The Helieon lighting system is the first plug-and-play sustainable solid-state lighting module to integrate high efficiency precision lighting with an easy-to-use socketed solution. It combines the unmatched LED array technology from Bridgelux and the superior interconnect technology from Molex, simplifying the process of designing, building, replacing and upgrading luminaires. Helieon enables flexibility in changing the look and feel of a lighting installation with the simplicity of replacing a light bulb. Beam angle, color temperature and light output can all be easily changed or upgraded with the simple turn of a wrist, post-installation, without the complexity and expense of removing the luminaire. Product options are tailored to match light output levels of traditional light sources, delivering between 500 and 1,500 lumens under application conditions in halogen and fluorescent color temperature options. Helieon modules are available with narrow, medium and wide flood beam spread options that enable precision effects for a wide variety of lighting applications. Last but not least, Helieon is very competitively priced, therefore accelerating LED introduction in general illumination. Willing to know more about this innovative product ? Go to our Helieon section on Molex.com or come visit www.helieon.com.